Something about the holidays brings out the kid in all of us. There's an instant magic in the air. It's most potent in the smiles of children when talk of the big man in red starts up. Growing up, my family went to great lengths to keep my brother and me believing Santa was real. One year, my dad sneaked outside on Christmas Eve and rang some sleigh bells before getting up on the roof and stomping around. My mother never had an easier time getting us off to bed. Another year, when we sprinted into the den at daybreak to see what loot had been left for us, we found sooty boot prints marking Santa's path from the chimney to the tree and then back again. I was old enough to have begun questioning the whole "from the North Pole around the world in one night" idea, but that "evidence" kept me going just a little bit longer. ut you don't have to believe in Santa anymore to revel in this season's childlike joy that so easily transforms into enchantment. Just look around. It's still there. It floats along on every note of holiday music, hangs off the branches of evergreens, and twinkles coyly behind the sparkle of a thousand brightly-colored lights. 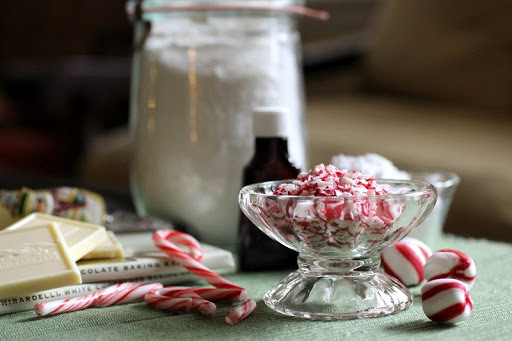 Despite the stress that's induced by our long to-do lists (that somehow only grow longer this time of year) masquerading as Scrooge and trying to replace the merry moments with instances of bah-humbug, I find the wonder again each holiday when I pull out my stand mixer and the ingredients to make Candy Cane cookies. I've done it every year for as long as I can remember, beginning this baking ritual with my mom when I couldn't even reach the kitchen counter without a stool. Every time I start it again, I can see her dog-eared cookbook sitting to the side of her mixer and her squinting to read the directions obscured by a thin dusting of flour. I recall my impatience as I quickly moved through my duties-measuring sugar, crushing peppermint candies with a rolling pin, getting the baking sheets down-so we could get to the really good part, licking the beaters and the bowl, and the best part, eating the finished product. Baking Christmas cookies with your kids-not for them-is a tradition they'll cherish long into adulthood. And these Candy Cane cookies are easy and so good. I've modified the original recipe (a Southern Living standard) to make them even easier and, I think, even tastier. So slow down a bit this year and spend some time with your little ones whipping up memories and making your own magic.